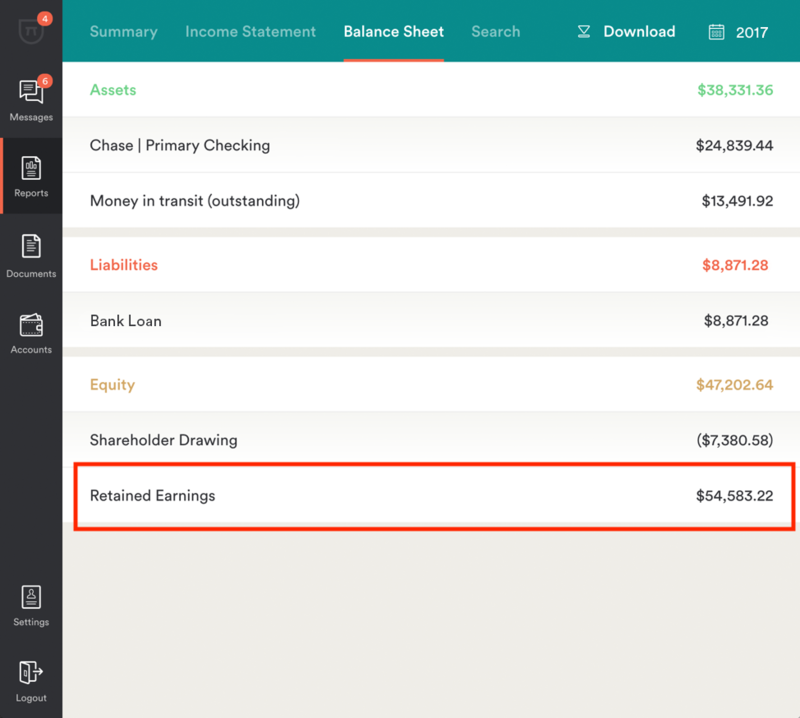 Have you ever looked at your balance sheet and wondered what that “retained earnings” line means? Retained earnings can tell you (and potential investors) a lot about the health of your business. Below, we break down exactly what retained earnings are, how they’re calculated, and why they’re so important. Your retained earnings are the profits that your business has earned minus any dividends or other distributions. Retained earnings (sometimes called Member Capital) can be found on your balance sheet in the equity section. Say you just started a business. Your beginning retained earnings would be $0. If you make a profit of $50 your first month, your retained earnings are now $50. Here’s a more complex example. Your business is taking off and you’re starting to make a healthy profit. Once your expenses and any liabilities are covered, you have some profit left to pay out dividends to shareholders. The money that’s left after you’ve paid your shareholders is held onto (or “retained”) by the business. Let’s use the retained earnings from the example above as our starting point. What’s the difference between retained earnings and net profit? Retained earnings and net profit are related, but distinct. There may be times when your business has a positive net profit but a negative retained earnings figure, or vice versa. Your net profit is what’s left at the end of the month after you’ve subtracted your operating expenses from your revenue. Retained earnings are what’s left from your net profit after* *dividends are paid out and beginning retained earnings are factored in. Starting to see higher profits but not sure what to do with it? Do a quick check on your retained earnings. If this number isn’t as high as you’d like (and if your business is relatively young), your safest bet is to keep these profits in the business and hold off on paying out any large dividends. Have a healthy net profit and retained earnings? Now might be the time to use some retained earnings for reinvestment back into the business. If you have a booming ecommerce company, you might need to upgrade to a bigger warehouse or purchase a new web domain. Because these are costs that are outside your regular operating expenses, they’re a great use of your retained earnings. Why do retained earnings matter? Retained earnings provide a much clearer picture of your business’ financial health than net profit can. If a potential investor is looking at your books, they’re most likely interested in your retained earnings. Why? Things like revenue and expenses can fluctuate month-to-month. If an investor is looking at December’s books, they’re only seeing December’s net profit. But retained earnings provides a longer view of how your business has earned, saved, and invested since day one. Not sure if you’ve been calculating your retained earnings correctly? Try a bookkeeping service like Bench. We’ll pair you with a bookkeeper to calculate your retained earnings for you so you’ll always be able to see where you’re at. Bookkeeping is tedious. But it doesn’t have to be. Here’s a stress-free guide to doing your own bookkeeping (that you’ll actually want to read).